Situated in central Kansas, Great Bend is the county seat of Barton County. The area had long been called home to the Plains Indians before explorers began to come to the region, beginning with Francisco Vasquez de Coronado in 1541. It really began to see people in numbers when the Santa Fe Trail was developed which passed right through what would later become Great Bend, leaving in its wake a long trail of history including Indian skirmishes, tales of frontier characters, rowdy cowboy days, and more. Though Barton County got its start in 1867, it would be several years before its population reached the level that it would be officially organized. Prior to that, the county was attached to Ellsworth County for judicial and revenue purposes. The first settlers came to the area in about 1870, living in rough dugouts and sod houses, fitted with holes in the wall to defend themselves against the Indians. Early settlers killed buffalo and other game to provide food, tanned hides which were sold to easterners, and a few tried farming but were unsuccessful because the buffalo tramped down the crops. By 1871, the area had grown to enough people that a petition was presented to the governor asking that the county be organized. In the same year, Great Bend was laid out by the Great Bend Town Company in anticipation of county organization and the coming of the Atchison, Topeka & Santa Fe Railroad. The town was named after the “great bend” of the Arkansas River, a prominent feature noted by early Santa Fe Trail pioneers. The first recorded settlers in Great Bend Township were Edward J. Dodge, who made a homestead entry on January 23, 1871, and D. N. Heizer, in May of the same year. Some of the other settlers of that year were John Cook, W. H. Odell, Thomas Morris, George Moses and Wallace Dodge. The Great Bend Town Company erected the first building, called the Southern Hotel in the fall of 1871 on what would become the northwest corner of the public square. The next building was built by Edwin Tyler, a little south of the Southern Hotel on the west side of the square, part of which was used as a dwelling, and the other part as a the first store in the fledgling city. For months, they would be the only buildings in the new “town.” However, that began to change in the spring of 1872, when a man named James Holland built another store on the north side of the square. Holland; however, soon went east to purchase goods and was never heard from again. He was thought to have been murdered for his money. In May, a man named A.S. Allen constructed a drug store on the west side of the square, quickly followed by a grocery and provision store by Ed Markworth, a hardware store by E.L. Morphy, and another grocery store by John Cook. Another hotel was also built called the Typer House, on the east side of the square and Great Bend was officially incorporated on June 17, 1872. When the Atchison, Topeka & Santa Fe Railroad made its first appearance on July 15, 1872, the town attracted even more settlers. The first publication in the county was also established that year – the Arkansas Valley, primarily a publication of the railroad, but its life was short. Early in 1873, Great Bend held its first election and A.A. Hurd was elected as its first Mayor. Officers and Commissioners were also elected and by popular vote, Great Bend was named the the county seat, winning out over Ellinwood and Zarah. That same year, the Barton County Progress was the next publication to make its appearance in the county but it also lasted only a few months. Until that time, there were no public schools in the county, and the people also voted bonds for that purpose and a very fine two-story frame schoolhouse was erected, one block west of the public square. That same year, a two-story stone and brick courthouse was built in the center of the public square. The first stone and brick business was also built the same year on the north side of the square. This was the only substantial improvement made until 1876, although several frame businesses and dwelling were erected. 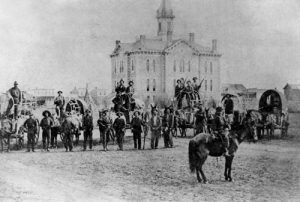 The years 1873 through 1875 were interesting years, as it was during this time that the city became a cattle shipping center, and yet another of the many rowdy Kansas cowtowns. The cattle trade would usually begin about the first of June and continue until the middle of October. A natural consequence of this trade, was lively times for the merchants while it lasted, and for the more orderly and peaceable members of the community, a constant dread. However, the advantages in trade were more than counterbalanced by the disadvantages to society. 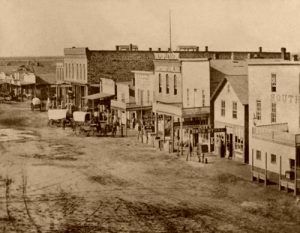 Like many other rowdy cowtowns, Great Bend had a number of shoot-outs during this time, the first of which occurred on July 2, 1873, when Marshall Gainsford killed a drunken buffalo hunter in self defense. By 1875, largely due to the cattle trade, Great Bend had nine saloons. The class of people that the cattle trade attracted to Great Bend was that class of thugs and harlots that many of time believed were a curse and a dread to every community, and when the Kansas Legislature in 1876, passed a law fixing the “dead line” thirty miles west of Barton County, the people of Great Bend felt relieved. This “dead line” was a line beyond which Texas cattle could not be brought, unless they had been lived for one winter in the State. The passage of the law had the effect of moving the cattle trade west from Great Bend, and with it went the many cowboys and other rowdy folks that the “peaceable” people had little tolerance for. In the meantime, another newspaper was launched in 1874 called the Great Bend Register which would last for decades and in 1876, another called the Inland Tribune in 1876. Also occurring in 1876, A.S. Allen put up a very neat and well finished two story stone and brick building on the corner of Curtis Avenue and Nagie Street, the first floor of which he used as a drug store, the upper floor being divided into offices. About the same time Gray & Baily erected a building of a similar character on the north side of the square, which was occupied as a hardware store by W. H. Dodge & Son. A flouring mill was also built by W. W. P. Clement. In 1877, the first church was built by the Catholics. Up until that time, the various congregations had met in private homes. The following winter, a Methodist Church was built, followed by a number of others in subsequent years.